If you have any little ones and are planning to go out for lunch or dinner, here is a nice coupon for you to take advantage of! 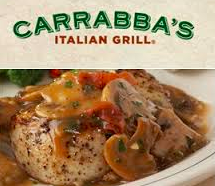 Now through September 3rd, you can snag a FREE Kid's Meal with an Adult Entree Purchase Coupon at Carrabba's Italian Grill! This is good for lunch and dinner, and is valid for dine-in or carryout. There is a limit of 2 free Kids Meals per coupon, per visit.